Mitali Chatterjee, a medical scientist is Professor of Pharmacology at Institute of Postgraduate Medical Education & Research, Kolkata, India. 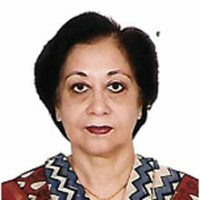 She obtained her MBBS from Calcutta Medical College, Kolkata, India in 1984, MSc in Medical Sciences from Cancer Research Unit in 1989 from University of Newcastle upon Tyne Medical School, UK. In 1992, she did her MD in Pharmacology from University College of Medicine, Kolkata, India and in 2000 obtained her PhD in Immunology from Indian Institute of Chemical Biology, Jadavpur University, Kolkata, India. She joined the University of Calcutta in 2000 and established an Immunopharmacology unit which has focussed on development of improved diagnostic and chemotherapeutic approaches against Leishmaniasis, a neglected tropical disease. In South Asia, Leishmaniasis includes a visceral form called kala-azar and has a dermal sequel called Post kala-azar Dermal Leishmaniasis (PKDL), the latter being unique to the Indian subcontinent. Importantly, in the absence of an experimental model, the responsibility of understanding the immunopathogenesis of PKDL lies squarely on the shoulders of clinical researchers. The group undertook this pertinent challenge and established that in PKDL, there is generation of a pro- parasitic, immunosuppressive milieu, which impairs the host’s capacity to respond to microbial ligands. Mitali Chatterjees group has developed a DNA based assays for diagnosis and monitoring of PKDL, and as part of the ongoing Leishmaniasis ‘active surveillance’ programme in West Bengal, her laboratory serves as the nodal centre that provides information regarding parasite load, a key marker for measuring chemotherapeutic effectiveness. In 2015, she was elected as a Fellow of the National Academy of Sciences, India and in 2017 as a Fellow of the Indian Academy of Sciences. Active surveillance identified a neglected burden of macular cases of Post Kala-azar Dermal Leishmaniasis in West Bengal	Ritika Sengupta, Surya Jyati Chaudhuri, Srija Moulik, Manab Kumar Ghosh, Bibhuti Saha, Nilay Kanti Das, Mitali Chatterjee Post Kala-azar Dermal Leishmaniasis (PKDL) develops in patients apparently cured of Visceral Leishmaniasis (VL), and is the strongest contender for being the disease reservoir. Therefore, existence of a few cases is sufficient to trigger an epidemic of VL in a given community, emphasizing the need for its active detection and in turn ensuring success of the current elimination program. This study explored the impact of active surveillance on the demographic profile of PKDL patients in West Bengal. An IL-10 dominant polarization of monocytes is a feature of Indian Visceral Leishmaniasis	Roy S, Mukhopadhyay D, Mukherjee S, Moulik S, Chatterji S, Brahme N, Pramanik N, Goswami RP, Saha B, Chatterjee M Leishmania donovani, the causative parasite of Visceral Leishmaniasis (VL), deviously manipulates host monocytes/macrophages to ensure its survival. Although monocytes/macrophages from patients with VL have demonstrated an impaired oxidative burst and antigen presentation, an unanswered yet pertinent question remains as to whether they are deactivated or alternatively activated. The significantly raised plasma levels of IL-4/IL-13 and IL-10 in VL patients suggested a microenvironment conducive for alternative activation of monocytes/macrophages. Accordingly, the classical markers for IL-4-driven monocytes/macrophages [M(IL-4)] were studied namely intramonocytic CD206+ , circulating CCL22 and CCL17, and were unchanged. Furthermore, the mRNA expression of Kruppel-like factor 4 (KLF4), peroxisome proliferator-activated receptors (PPAR)-γ and arginase-I (ARG-I) in peripheral blood mononuclear cells was unaltered. However, markers for IL-10-driven monocytes/macrophages [M(IL-10)], namely soluble CD163, intramonocytic IL-10, and circulating CXCL13 were significantly increased. Monocytes/macrophages of patients with VL demonstrated an increased expression of markers for M(IL-10), along with the absence of markers for M(IL-4). Taken together, in human VL, manipulation of these IL-10 polarized monocytes-macrophages may pave the way for improved therapeutic outcomes. Impaired activation of lesional CD8+ T-cells is associated with enhanced expression of Programmed Death-1 in Indian Post Kala-azar Dermal Leishmaniasis	Shibabrata Mukherjee, Ritika Sengupta, Debanjan Mukhopadhyay, Claudia Braun, Sneha Mitra, Susmita Roy, Nilay Kanti Das, Uttara Chatterjee, Esther von Stebut-Borschitz & Mitali Chatterjee Post Kala-azar dermal leishmaniasis (PKDL), caused by Leishmania donovani is the dermal sequel of Visceral Leishmaniasis and importantly, is the proposed disease reservoir. The survival of Leishmania parasites within monocytes/macrophages hinges on its ability to effectively nullify immune activation mechanisms. Thus, delineating the disease-promoting immune mechanisms can facilitate development of immunotherapeutic strategies. Accordingly, in the absence of an animal model, this study aimed to delineate the status of CD8+ T-cells in patients with PKDL. At disease presentation, the absence of CD4+ T-cells at lesional sites was concomitant with an overwhelming infiltration of CD8+ T-cells that demonstrated an absence of Perforin, Granzyme and Zap-70, along with an enhanced expression of Programmed Death-1 (PD-1) and the skin-homing CCL17. Additionally, the lesional CCR4+CD8+ population was associated with an enhanced expression of IL-10 and IL-5. In circulation, the enhanced CD8+CCR4+ T-cell population and raised levels of CCL17/22 was associated with an increased frequency of PD-1, while CD127 was decreased. Taken together, in PKDL, the enhanced plasma and lesional CCL17 accounted for the dermal homing of CD8+CCR4+ T-cells, that along with a concomitant upregulation of PD-1 and IL-10 mediated immune inactivation, emphasizing the need for designing immunotherapies capable of reinvigorating T-cell potency. M2 Polarization of Monocytes-Macrophages Is a Hallmark of Indian Post Kala-Azar Dermal Leishmaniasis	Debanjan Mukhopadhyay, Shibabrata Mukherjee, Susmita Roy, Jane E. Dalton, Sunanda Kundu, Avijit Sarkar, Nilay K. Das, Paul M. Kaye, and Mitali Chatterjee The high level of functional diversity and plasticity in monocytes/macrophages has been defined within in vitro systems as M1 (classically activated), M2 (alternatively activated) and deactivated macrophages, of which the latter two subtypes are associated with suppression of cell mediated immunity, that confers susceptibility to intracellular infection. Although the Leishmania parasite modulates macrophage functions to ensure its survival, what remains an unanswered yet pertinent question is whether these macrophages are deactivated or alternatively activated. This study aimed to characterize the functional plasticity and polarization of monocytes/macrophages and delineate their importance in the immunopathogenesis of Post kala-azar dermal leishmaniasis (PKDL), a chronic dermatosis of human leishmaniasis. Monocytes from PKDL patients showed a decreased expression of TLR-2/4, along with an attenuated generation of reactive oxidative/nitrosative species. At disease presentation, an increased mRNA expression of classical M2 markers CD206, ARG1 and PPARG in monocytes and lesional macrophages indicated M2 polarization of macrophages which was corroborated by increased expression of CD206 and arginase-1. Furthermore, altered vitamin D signaling was a key feature in PKDL, as disease presentation was associated with raised plasma levels of monohydroxylated vitamin D3 and vitamin D3- associated genes, features of M2 polarization. Taken together, in PKDL, monocyte/macrophage subsets appear to be alternatively activated, a phenotype that might sustain disease chronicity. Importantly, repolarization of these monocytes to M1 by antileishmanial drugs suggests that switching from M2 to M1 phenotype might represent a therapeutic opportunity, worthy of future pharmacological consideration. Monitoring of Parasite Kinetics in Indian Post–Kala-azar Dermal Leishmaniasis	Srija Moulik, Surya Jyati Chaudhuri, Bikash Sardar, Manab Ghosh, Bibhuti Saha, Nilay Kanti Das, and Mitali Chatterjee The potential reservoirs of leishmaniasis in South Asia include relapsed cases of visceral leishmaniasis (VL), patients with post–kala-azar dermal leishmaniasis (PKDL), and an asymptomatically infected population. Therefore, assessment of cure in terms of parasite clearance, early detection of PKDL, and asymptomatic VL are pivotal for ensuring elimination. This study aimed to monitor the efficacy of miltefosine and liposomal amphotericin B (LAmB) in PKDL based on parasite load. VALIDATE: Exploiting the synergy between complex intracellular pathogens to expedite vaccine research and development for tuberculosis, leishmaniasis, melioidosis and leprosy	Fletcher HA, Chatterjee M, Cooper A, Hussell T, Kaye PM, Prior J, Reljic R, Vermaak S, Vordermeier M, Williams A, McShane H For several complex intracellular pathogens, we have an urgent need for effective vaccines and yet there are common barriers to vaccine development. These diseases, including tuberculosis, leishmaniasis, leprosy and melioidosis, cause a huge burden of disease and disproportionately affect low and middle income countries. They are therefore often neglected due to the marginalisation of affected populations and the poor predicted commercial return on investment. Barriers to vaccine development include an incomplete understanding of protective immunity and translation from the bench into clinical vaccine trials. The current linear approach to vaccine research and development for these pathogens, which involves basic research, vaccine design, and vaccine evaluation in preclinical challenge models and clinical trials, is inefficient for these complex intracellular pathogens. We have established a Global Challenges Research Fund Network for VAccine deveLopment for complex Intracellular neglecteD pAThogEns, "VALIDATE", where we aim to adopt a more flexible, integrated cross-pathogen approach to accelerate vaccine research and clinical development for these four pathogens, by cross-pathogen analyses, cross-discipline collaborations, and repeated integration of data from human and animal studies. This network provides a unique opportunity to bring together individuals working on four exemplar complex intracellular neglected pathogens ( M.tb, Leishmania spp., B. pseudomallei and M.leprae), which share a common lifestyle as pathogens of macrophages, induce similar end-stage pathologies and alter host immune and metabolic responses. The horizontal collaborations established throughout this network, together with the provision of a protected environment for early data sharing, will exploit these biological synergies. By interrogating mechanisms that lead from infection to disease, we will be able to develop common vaccine development strategies for these and other complex intracellular pathogens.